Note: The below proposed increase is expected to be effective by March or April of 2018. Rise in bus fares will be only after 4 Km distance (i.e Long distance). Student monthly bus pass will hike by Rs.50 and similarly, daily pass will +20 up. Note : AC Bus fares (Hybrids and Mini) will be hikes by Rs.5 (Approximate) compared to current rates. Fares Note : Their might be difference in above / below listed fares and it may change from time to time. May 2016 Fare Updates : Around 50% drop in AC bus fares. BEST has come up with some serious decisions to revise and slash down their fares especially for AC buses and also for regular buses at some level. If final approval is given, the cheer in commuters cheeks is sure as the drop in fares is around 50% which mean half of the cost saved commuting in AC Buses. Below are the proposed and almost confirmed new fares compared to old. With this they hope to get more footfalls on bus which will help recover from current loses and in general it is good that less of private taxi & cars will ply helping de-congest Mumbai roads. 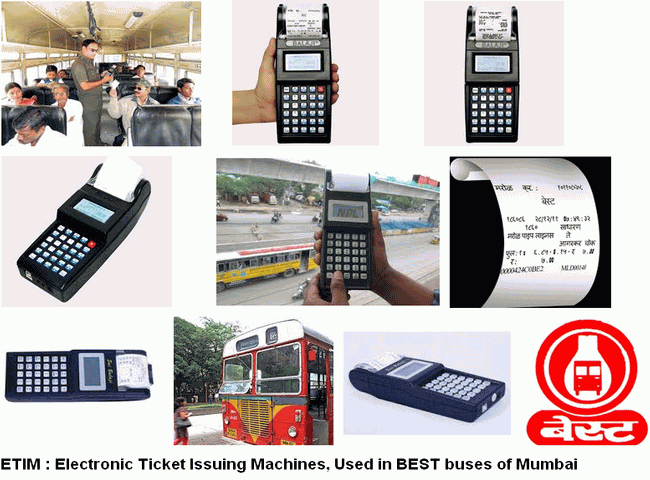 Daily (One Day Valid) Pass for Mumbai City Locations, Western &Central Suburbs for Air Conditioned and NON-AC BEST buses. After next 11 days, i.e. effective 1st February 2015 revised fares for regular and air conditioned (AC) buses will keep the middle class commuters on toes upon which these citizens who daily travel by buses will revise their monthly budget plans. Not just that, Another hike in BEST fares effective 1st April 2015 has already been planned and just waits for the date. Now what more to say. Below are the revised upcoming fare charts. Monthly fares for school students of civic and private schools using dedicated BEST bus services has been revised with 100% hike. This is something which was to be thought before going ahead of applying new fares for students within BMC and Outside BMC limits as not everyone can afford same. None of the citizen is happy with the decision as they see BMC and BEST being not caring towards middle class by funding giant new projects utilizing more funds compare to giving relief to students by spending a little comparatively. Below are the revised fares for students using “DEDICATED BUS FACILITIES” by BEST. Today, as on 27 November 2014 as i update this post the news are that starting from March 2014 the 40 lakh passengers, the common man’s last cheapest travel option in Mumbai is getting more costly, specially affecting those 25 lakh travelling short distance via this public buses as the existing total number of 4200 fleet still not giving profits to BEST department. The inflation slap and now the coming up fare hike is going to slap the same common man especially those who travel via our BEST buses within 7 km range as that distance range is getting more costlier now. Brihanmumbai Electric Supply and Transport has already finalized and put up the new fare list for approval to State transport Authority and civic body’s standing committee. The old km distance rage of 2 KM, 3 Km, 5 KM and 7 KM has been revised to 2, 4, 6 and Jumping directly to 10 KM and the effects on Mumbaikars pocket is easily seen from below bus fare chart. Note : See the new KM jump from 6 to 10, which directly impacts the fares. Updates June 2015 : BEST already have daily pass system for city costing Rs.70 (Valid for 1 day only). One can buy this pass by paying one time charge of Rs.70 and can travel in BEST Non AC Regular bus around city and suburbs. Auto and Taxi fare hikes has already given pressure on local public who travels regularly and to support them and also gain business by retaining them, BEST have introduced new daily pass for ISLAND CITY ONLY Rs.40 and FOR SUBURBS ONLY Rs.50. Kindly note that these are the additional one day pass and the old Rs.70 pass (CITY and SUBURB) is still available. 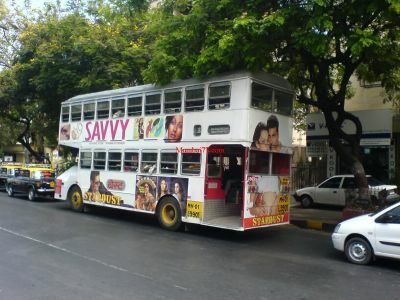 Mumbai people has to pay more to commute in BEST buses from today since the revised fares for buses are out with hike in daily travel prices and also in monthly and quarterly passes. This revised tariff proposal is effective from Wednesday midnight for all 42 lakh people who travel daily in Mumbai buses. The new fare that is hiked is about 30 percent more then before. For initial 2 kilometres it has been increased to Rs.4 which was Rs.3 previously and an additional of Rs.2 further. 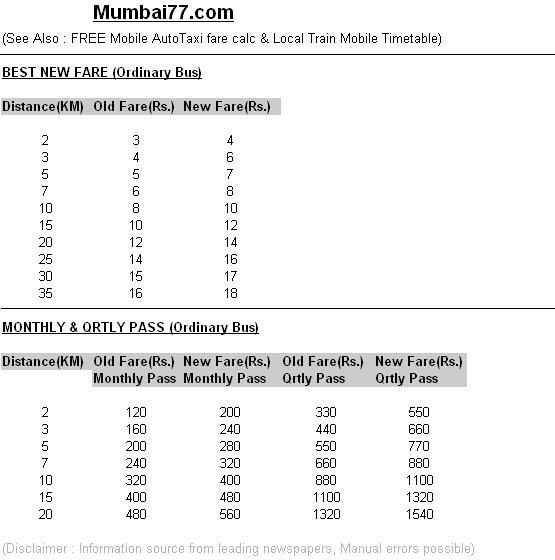 For quarterly pass the new fare hikes to Rs.80 and Rs.120 minimum for monthly and quarterly passes. Also that Air Conditioned (AC) BRTS bus pass has been hiked by Rs.500.